Passages to the Past: Borgia Madness Monday Giveaway #3!! Borgia Madness Monday Giveaway #3!! Welcome to round three of the Borgia Madness Monday giveaway!! Thanks to Beth at Sourcebooks every Monday until the end of the new Showtime series The Borgias I will be hosting a giveaway for 2 copies of Sarah Bower's Sins of the House of Borgia to some lucky winners and all you have to do is answer a question about the series! Now that the series is now on it's 8th episode, I want to know...what are your thoughts on the casting? Is there an actor or actress you feel would have better suited the role? Violante isn't supposed to be here, in one of the grandest courts of Renaissance Italy. She isn't supposed to be a lady-in-waiting to the beautiful Lucrezia Borgia. But the same secretive politics that pushed Lucrezia's father to the Vatican have landed Violante deep in a lavish landscape of passion and ambition. Violante discovers a Lucrezia unknown to those who see only a scheming harlot, and all the whispers about her brother, Cesare Borgia, never revealed the soul of the man who dances close with Violante. But those who enter the House of Borgia are never quite the same when they leave-if they leave at all. Violante's place in history will test her heart and leave her the guardian of dangerous secrets she must carry to the grave. - To enter, please leave your answer to the above question in the comments section below and include your email address. - Giveaway is open to US entries ONLY! - Giveaway ends on May 22nd. I think I like all the actors for the series. Truth to tell I like Jeremy Irons the best. The way his thoughts are in his eyes, one can 'read' his thoughts. I haven't watched it yet, but now that I know about it I will check it out. Love the cover of this book. Please enter me. Thanks! I think I pretty much like the entire cast. They are all doing a very good job...however Juan annoys me but I think it's the character that annoys me and not the actor. Oh and the guy you plays the Prince of Naples! His voice drives me nuts! It's so creepy and weird, but he's not a main character. Thanks for another chance to win this novel! I want to win a copy soo badly! +1 I tweeted via twitter share buttons. +1 I'm going to post this on my sidebar b/c I want to increase my chances so badly! I'm not sure if Lucrezia is as innocent as she is supposed to be. Some underlying things don't seem quite right. Thanks for the giveaway offer. I think Irons is perfect. Okay I caved...I ordered Showtime...lol Trying to catch up and have only had time to watch the first three episodes...but I'm sure I'll be all caught up by the end of the week ;) So far I love Jeremy Irons and he is one of the reasons I wanted to watch the series in the first place. He is such a good actor because he is not the "same" in every role that he takes on. The only other actor that I feel is up to his standards to play this role is Daniel Day Lewis. Just tweeted this week's giveaway. Just shared this week's giveaway on facebook. Just added this week to my sidebar. Not sure I like the casting of Lucretzia. I like the actors they have in the roles, especially Jeremy Irons! For the most part, I love the cast, I just wish they'd separated the two Alfonsos of Naples, because I can't equate this Alfonso, with his REALLY annoying voice, with the one Lucrezia fell in love with. This is the first thing I've seen Holliday Grainger in where she hasn't irritated me, so it's a pleasant change. The slip in historical accuracy has been more and more evident, though. :-( Too bad! The true story is dramatic enough without altering it. I absolutely LOVE this show (although I am slightly behind since I didn't watch the last episode yet) and would LOVE for a chance to read this book. THAT, would be a dream come true. I must agree with all, the casting of Jeremy Irons is perfect. His acting extends to his body-language, he doesn't portray a character, he BECOMES it, which I love. Francoise Arnaud is absolutely PERFECT as Cesare. Although a part of me really wishes that Jeremy Iron's son Max Irons was playing the other son Juan Borgia, instead of David Oakes. Not that Oakes is bad, but I really liked Max Irons in "Red Riding Hood", although I didn't really like the movie itself - so there's something. That's my two cents. Don't enter me, but I so enjoy answering the weekly questions that I just had to comment. I can't make any complaints, I think the casting is spot on. Maybe Jeremy Irons face is a little well known, and one might have wanted an relatively lesser known face like the rest of the cast, but Mr Irons does act it so well! He can do that calculating look behind the eyes with supreme quality. I think the Borgia children are well cast too - but particularly I want to mention Francois Arnaud and David Oakes as Cesare and Juan, they are both very demanding roles - Cesare is a really subtle and conflicted character, and Juan must be tremendous fun to play as a total selfish incompetent fool, but here and there are glimmers that Juan's character is beginning to be disabused of his comfy little world view and having to face up to serious stuff like leading armies into battle and so on. 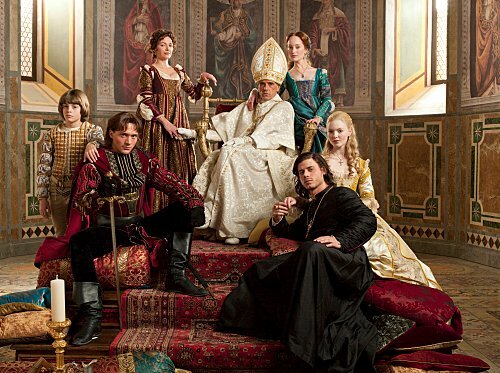 I also want to give special mention to some of the supporting cast who I think were particularly well cast and are doing an amazing job - Julian Bleach as Niccolo Machiavelli, Michel Muller as King Charles VIII, Augustus Prew as Prince Alfonso of Naples, and Cesare Taurasi as Piero de Medici. Even though they are secondary characters, I felt that these four embodied their roles particularly well - they were pitched just right, they feel like subtle, real people not cardboard cutouts, I can believe that these people existed. I love how Julian Bleach brings this serious but sharp quality to Machiavelli, you really get the sense that this guy is dangerously intelligent and there's much more going on in his head than you can even fathom. I love how Michel Muller has made the French king this mix of ruthless and honourable, a man who is brutal in war and loathes flattery but who deals valiantly with a noble lady like Lucrezia. I love Augustus Prew's performance as Alfonso - yes I was surprised when I discovered that they had amalgamated Alfonso II and Alfonso of Aragon, but now I just can't wait to see how it's going to play out! I think Alfonso is an awesome character. His propensity to just make totally socially inappropriate comments is hilarious, and he's clearly found amusement in being given almost unlimited power at such a young age - it's so funny to watch the sour, disgruntled reactions of his guests, who can't say anything in reply. That said, I don't think he's totally mad, I mean he seems to rule Naples at least competently which means he must be mostly mentally sensible, and I thought the death scene of old king Ferrante created just a hint of sympathy, so I think with time and very likely a bigger role in Season 2, the character will have room to grow. And Taurasi as Medici, even though it's quite a small role, I say well-played. Medici comes across as practical, smart and sensible, though not quite as dangerously sharp as Machiavelli, but smart enough to employ a man like Machiavelli. Of all the Italian potentates he comes across as the most sane. Borgia Madness Monday Giveaway #2! !